On a dull day in the markets, these companies shine on. At the halfway point of the trading day, the Dow Jones Industrial Average (INDEX: ^DJI) was down 0.07% to 13,282. The S&P 500 (INDEX: ^GSPC) is up 0.28% to 1,436. There were two economic releases from the U.S. Department of Labor today in its Employment Situation report for August, and each proved negative for stocks. The first announcement was that total nonfarm payroll employment rose by 96,000 jobs in August. This is down from the 141,000 jobs added in July and below analysts' expectations of 125,000 jobs. The second economic release was the unemployment rate, which fell to a seasonally adjusted 8.1%. On the surface, that's better than last month's 8.3%, which analysts expected to be this month's result. However, the seemingly better unemployment rate is actually bad news, as it was the result of 368,000 people dropping out of the labor market -- not the result of large numbers of jobs being filled. 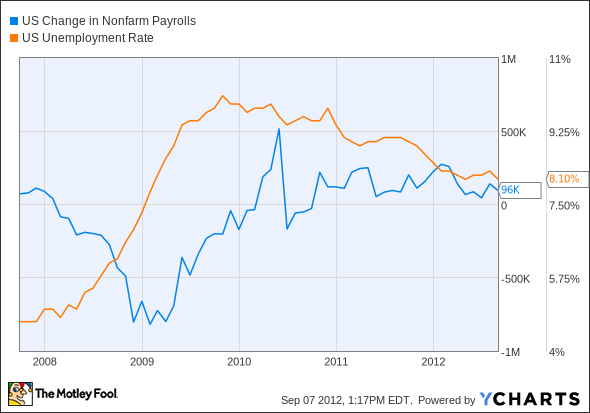 US Change in Nonfarm Payrolls data by YCharts. While the reports by themselves are negative for stocks, investors believe this raises the chance that the Federal Reserve will undertake some form of economic stimulus. While the Dow is largely unchanged, many stocks are up, and a few are surging upward. Today's Dow leader is Bank of America (NYSE: BAC), up 4.67% to $8.74. For the second day in a row, the banking sector as a whole is up, and Wall Street Banks are leading the way. Banks have been hurt by fears of a European financial crisis. Yesterday's moves by European Central Bank President Mario Draghi should hopefully quell those fears for the time being. The reason the bank is up today is the hope of a stimulus by the Federal Reserve, which would be a boon for the big banks. The big banks have been doing well: The FDIC recently released its Quarterly Banking Profile, which showed continued improvement in bank finances. Bank of America was the third-best-performing Dow stock in August. With yesterday's and today's big jumps, Bank of America may be one of September's top three as well. Fool analyst John Maxfield recently took an in-depth look at Bank of America. Click here to read his take. Second behind Bank of America is Caterpillar (NYSE: CAT), up 4.05% to $88.23. Caterpillar is a cyclical company, highly dependent on GDP growth for profitability. A stimulus for the economy would thus be a boon for the maker of construction equipment. Caterpillar has been chugging along lately, and last month it announced that its global equipment sales were up 14% in the three-month rolling period ending in July. That's up from May's and June's rate of 11%. Asia and North America were strongest, with 25%-plus growth, while Latin America, Europe, the Middle East, and Africa all showed small declines. Fool analyst Neha Chamaria believes Caterpillar is worth a look. Alcoa (NYSE: AA) is third, up 2.57% to $8.98. Like Caterpillar, Alcoa is a cyclical company highly dependent on GDP growth for profitability. Today's poor economic releases raise hopes for a move by the Fed to boost economic growth, which is why Alcoa is up. Alcoa has had a rough few years as the economy has slowed, pushing commodity prices down. Aluminum prices have fallen 30% since April 2011, leaving Alcoa shares in a slump. If China's economy continues to slow, things could get worse for Alcoa. Despite the negatives surrounding Alcoa, Fool analyst Sean Williams still believes the aluminum giant will outperform the market. Click here to read his analysis. Watching the broad market each day is exciting, but investing doesn't have to be gut-wrenching and stressful. If you're in the mood to pick up some solid buys for the long term, The Motley Fool has created a brand-new free report from Motley Fool's expert analysts called "2 Dirt Cheap Stocks With Huge Dividends." It won't be available forever, so click here -- it's free.